The Noblex series of panoramic cameras is made by Kamera Werk Dresden. The cameras are made in the same factory where Charles Noble ran KW from 1938. 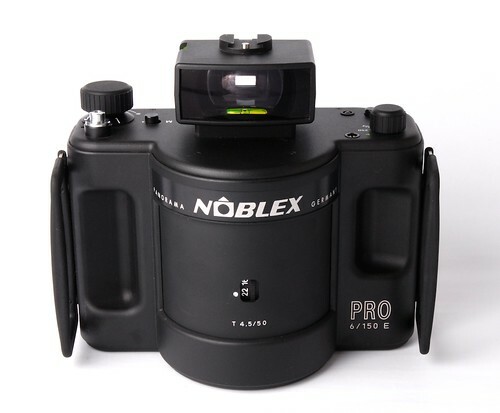 The first Noblex cameras were introduced in 1992. Models exist for 35 mm and 120 film. They are plastic-bodied. As in many panoramic cameras (such as the Widelux and Horizont), the lens rotates during exposure to cover the wide format, and a slit behind the lens and travelling with it forms a focal-plane shutter. However, whereas in many panoramic cameras, the lens swings through little more than the angle required to cover the picture, the lens in the Noblex rotates through 360°; the first part of the rotation serves to accelerate the lens so that its speed during the exposure is constant, giving even exposure across the frame. The lens in most of the cameras currently made (as at July 2012) is designated a Rotar T (a 29 mm f/4.5 in the 35 mm models, and a 50 mm f/4.5 in most of the 120-film cameras); however, cameras (such as that illustrated here) were previously made with lenses of the same specification and labelled as Tessar, Noblar T, or T.
The cameras allow manual control of the shutter speed and aperture. There is also an accessory exposure meter, the Panolux, for each range of cameras, which is partially coupled to the camera. The Panolux unit controls the shutter speed automatically, and even allows the speed of rotation to be varied across the frame, to compensate for scenes with varied brightness, but does not detect the aperture set on the camera; this must be manually entered. The Panolux has light cells on the front and back, and can be used for incident- or reflected-light metering. The earliest models (at least the 135 Pro Sport) cannot be used with the Panolux. Fixed, rotating-lens panoramic cameras, all for 24x66 mm format on 35 mm film (a 127° angle of view). All the 35 mm models are fixed-focus, relying on the aperture control to give adequate depth of field. Some of the 35 mm cameras have shutter speeds 1/30 - 1/500 second, essentially all suitable for hand-held use; others (the 135U and UC) have speeds down to 1 second. All except the Pro Sport allow 3 mm of front rise. Noblex Pro 6/150 S, with a 50 mm f/4.5 Tessar. Fixed, rotating-lens panoramic cameras for 120 film. Most models (certainly the UX and FS) have three-position zone focusing, at infinity (actually 17.2 m for the FS model), 'medium' (6.5 m for the FS) and 'near' (2.8 m for the FS; the exact focus distances differ for other models). Closer focus is possible with add-on close-up lenses. As with the 35 mm models, the medium-format cameras have either a normal range of shutter speeds, 1/15 - 1/250 second, or a range extended down to 2 seconds (the two UX models). The company also made prototypes of a stereo camera for 120 film, the Noblex P3, but this was never manufactured. A prototype 4x5-inch monorail SLR camera, the Prestoflex 4x5 was offered for sale at Westlicht in June 2017. The metal-bodied camera comprises a box body with a manually-raised mirror for reflex viewing/focusing from above, and mounted on a short rail projecting from the front standard, to which it is also linked by a bellows. The auctioneer's notes state that the bellows and viewfinder are interchangeable (supposing alternate parts exist). The camera offered for sale was fitted with an incomplete lens and electronic shutter unit. It appears to have only limited front camera movements. ↑ McKeown, James M. and Joan C. McKeown's Price Guide to Antique and Classic Cameras, 12th Edition, 2005-2006. USA, Centennial Photo Service, 2004. ISBN 0-931838-40-1 (hardcover). ISBN 0-931838-41-X (softcover). p538; McKeown gives no details about Noblex cameras other than this date. ↑ Instructions for the Panolux 135 (for the 35 mm cameras; PDF, 290 kB) and the Panolux 150 (for MF cameras; PDF, 510 kB) at manualslib.com. 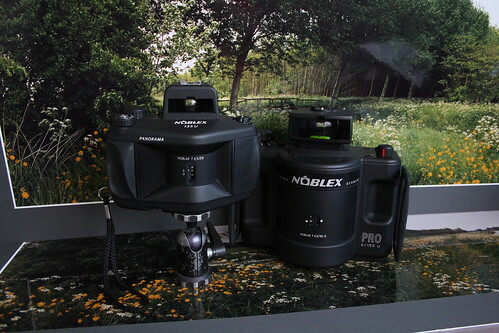 ↑ Noblex 135N sold at the eleventh Westlicht Photographica Auction on 26 May 2007. ↑ Noblex 135C and 135UC datasheet (PDF, 202 kB)(archived) at the KW Dresden website. 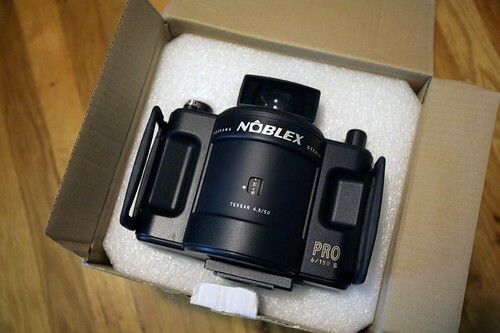 ↑ Noblex Pro 6/150 F sold at the fourteenth Westlicht auction on 30 November 2008. ↑ Noblex 150 FS datasheet (PDF, 61kB)(archived) at the KW Dresden website. ↑ Prestoflex 4x5 prototype at Westlicht Photographica Auction, June 2017. Noblex camera manual download page (archived) at the former KW Dresden website. This page was last edited on 22 December 2017, at 06:17.